Drunk texting? Sure! We've all done that at some point of time. But drunk blogging? Well, that's definitely a first for me! Blame it on my mum's birthday. Yes, you read that right! Its my mum's b'day and her b'day cake that's gotten me here. Not that I am complaining! I could probably go for a couple of slices more, though the blurred edges of the words warn me otherwise. 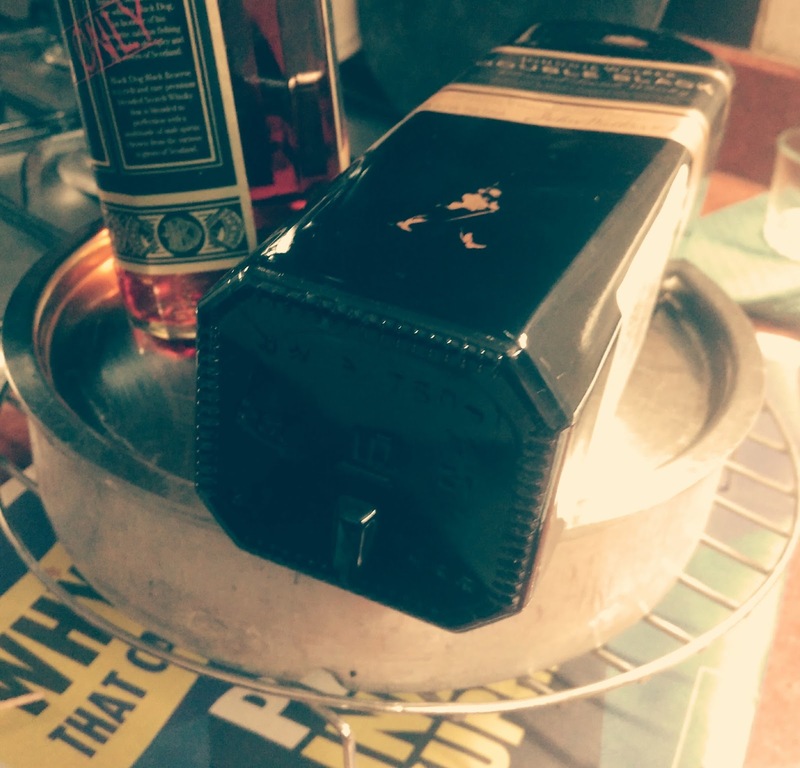 Let me start by saying that my mum's favorite present are those beautiful boxes of dainty liqueur chocolates. With very little time to shop, I am embarrassed to say I came up with naught. This would have been acceptable had I a heartwarming present on standby. But alas! I failed there as well. So I thought of the next best thing. Make her some liqueur chocolates. And as my brains unfroze they decided to take it a step further. Chocolate and liqueur in a cake. An all in one dessert! Now it would have been great had I stuck to the thought and used one of my regular recipes. But no when you go big, why not go grand?! That's when we went from dainty to drunk! 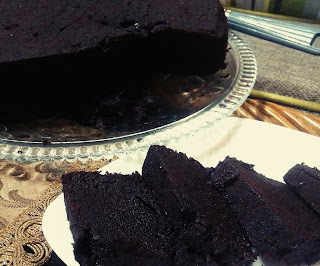 In my quest for the best ever chocolate rum cake, Google kept pointing me towards the Caribbean inspired dark chocolate and rum cakes. And the more I read, the more I knew I just had to make the most chocolatey, most boozy ever rum cake. Decadent and degenerate. Enter the recipe on foodinmybeard. 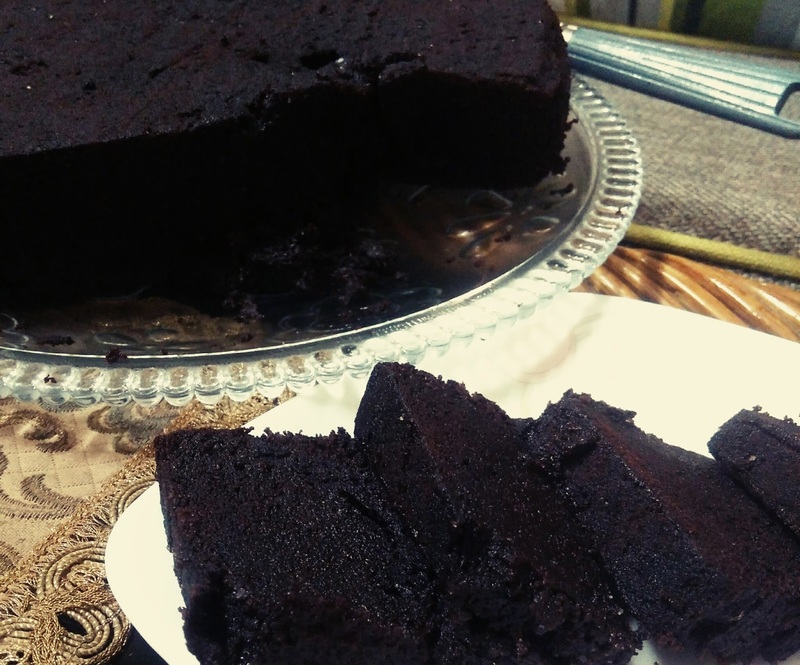 After having devoured hundreds of rum and choc recipes, I can honestly say that this was hands down the booziest and easiest cake around. I knew I wouldn't rest till I made it. And well, ate it! 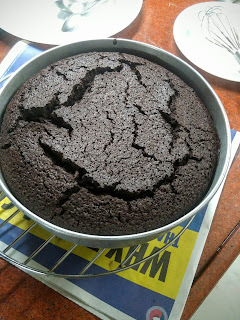 Now the cake came out of the oven looking all normal and innocuous. And then it was subjected to this. Now the bottles on top are merely to add weight to the lid, and don't actually form part of the recipe. But below the lid is a sinful, booze addled rum butter sauce that with the extra weight squishing it down, permeates every crumb of an already very rummy cake. The result? Drunk Blogging! Microwave the butter, chocolate and rum for 30 seconds. Whisk. If it hasn't melted completely, microwave again for 30 seconds. Whisk till smooth. Add the sugars and whisk well. Now add the eggs one at a time, whisking well after each addition. Sift all the dry ingredients together. Add half the dry mix to the wet batter and mix well. Now add the rest and mix till combined. Preheat the oven to 180 C. Pour the batter into a greased and lined cake tin. Bake for 45 minutes or till done. Once the cake is done, take it out and poke holes all over with a toothpick or skewer. Gently pour over the entire butter sauce. Cover with a lid that touches the surface of the cake, and weigh down with additional bottles. Once the cake cools completely, flip onto a serving tray and for once, you can drink your rum and eat it too! Rum Butter Sauce: Heat together the butter, sugar and 1/4 cup of rum. Bring to a boil and let it boil for a minute more. Take off the heat and whisk in the remaining 1/2 cup of rum. Pour warm over the cake. This is the lethal weapon that turns your cake from decadent to drunk! I totally love chocolate cakes. This recipe seems like something I've never heard of before. Rum's really not my thing, otherwise I would have definitely tried it out. sweetjaw. Awesome Inc. theme. Theme images by linearcurves. Powered by Blogger.